I have been OBSESSED with my Instant Pot since I bought it over the holiday season. If you follow me on instagram stories, you know the love is real. Blake and I have been recipe testing every week. And I made this one last week and knew it would be the first recipe to share. 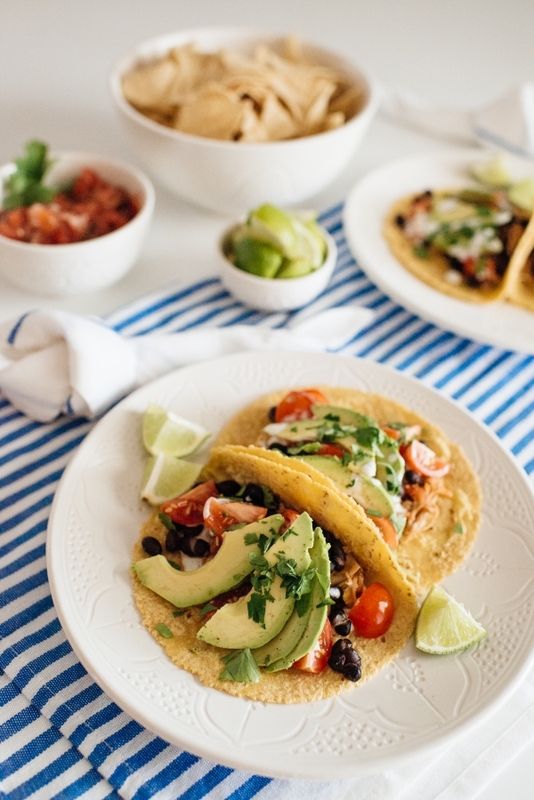 We make tacos every week and this recipe is a time saver that does not skimp on flavor. I am also a big believer that chicken thighs really add a flavor punch to a meal. But don’t worry, if you aren’t into that you can easily substitute chicken breasts. No judgement 😉 The chicken cooks in just 20 minutes and I am telling you, it’s so easy that it will be come a weeknight favorite. Like, ridiculously easy. The Instant Pot really does all the work. Did I tell you how much I love this thing?!!? A lot of you have asked what the Instant Pot is. It’s a combination pressure and slow cooker and it does a million other things. So think about all your favorite slow cooker recipes that sit and stew for hours on a Sunday… well imagine cooking them FAST in about 30 minutes. That is the real advantage of this machine is the pressure cooking. Makes weeknight meals super easy. I feel like I am sounding like a big Instant Pot ad right now (THIS POST IS NOT SPONSORED!!!) but I am telling you… I am obsessed. So here is the recipe. Hope you guys love it as much as I do. If you happen to make it, feel free to tag me on instagram with #eatsleepwearCOOKS. Would LOVE to hear how it turned out. I also have to thank The Little Market for supplying the most beautiful ceramics and linens to make our taco night extra special. I will link all the pieces below. Chop tomatoes and cilantro. Slice avocado. Drain black beans. Pull out sour cream. Set all these toppings aside. Place all chicken thighs on a cutting board and season both sides with salt, pepper, chili lime seasoning, and garlic powder. I put approximate measurements above but I just eyeball the amounts. I like to go heavier on the chili lime and garlic powder as it adds some nice flavor. Turn Instant Pot on: Sauté Mode. Add 2 tablespoons of olive oil and let heat. Sauté chicken on both sides just until brown. Pour 1 cup salsa and 1/2 cup water over top of the chicken and give it a quick stir. Place on top and seal Instant Pot. Make sure your vent is set to Sealing. Put on Pressure Cook Mode on High for 20 minutes. A tip here is that you can click the Meat Mode and adjust the time with the – and + symbols. When timer goes off, do a Quick Release of steam by changing the vent position on the top of your pressure cooker. ALWAYS make sure to wear oven mitts when you do this so you don’t burn your fingers or skin. Open Instant Pot when the metal pin on the top has completely dropped. Then place chicken in a bowl and shred. Place shredded chicken back in salsa mixture on Sauté Mode and simmer while mixing in meat if you want to reduce the mixture. 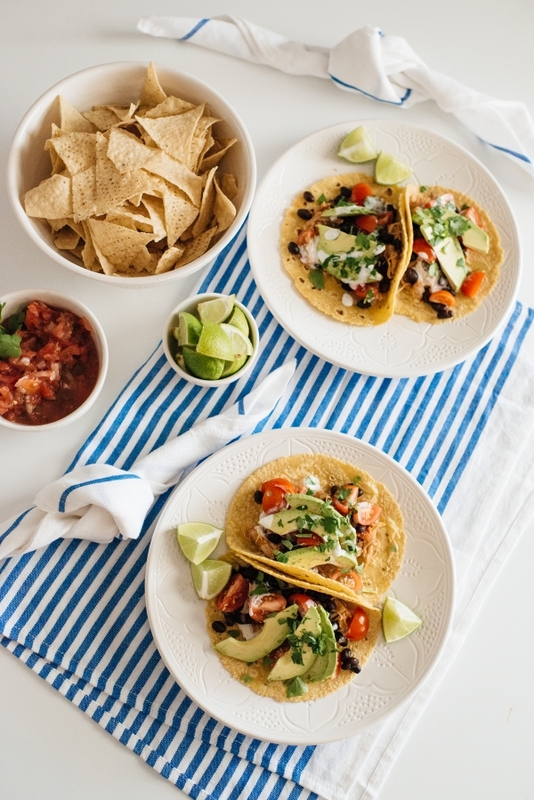 Pick your favorite toppings and assemble your tacos. Bon appetit! Sharon - This recipe looks delicious. When I try it out I’ll let you know how it came out!